There may be times when it is necessary to award a behaviour when homework tasks are being submitted (For example, issuing a detention for missing homework submissions). 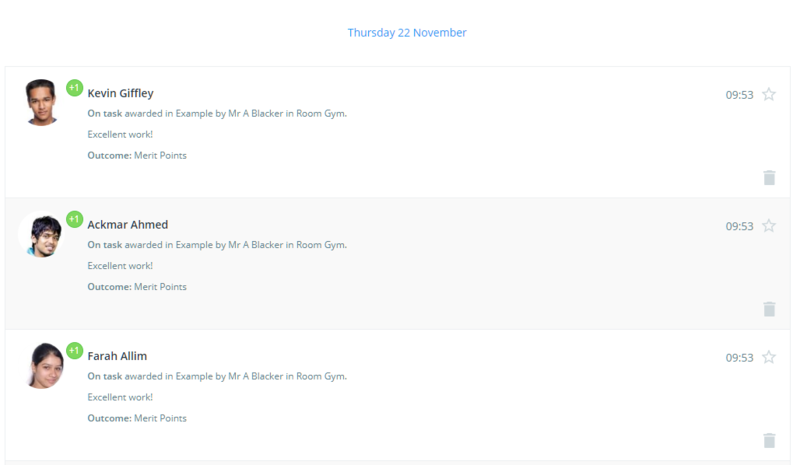 To award behaviours whilst marking submissions for a homework task, click on the Classes tab along the top of the page and click on the start button for the class of your choice. Once each pupil's homework submissions have been marked, you can award a behaviour based on submission types. To award a behaviour to all pupils who successfully submitted their homework task on time, click on the Award all submitted button along the top of the page. Next, select the behaviour of your choice from the side menu. A popup will appear, listing all pupils that submitted the homework task. 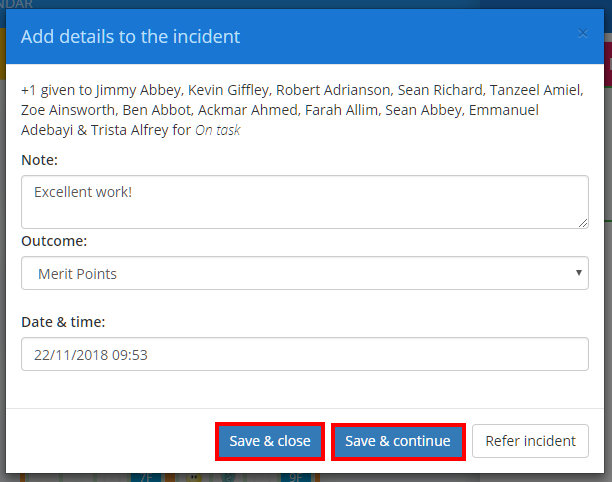 You can enter additional information about the behaviour in the Note and Outcome fields. Click on the Save & close button to stop marking homework submissions, or click on the Save & continue button to carry on marking submissions. Once awarded, the behaviour incidents will appear in your school's Activity feed. 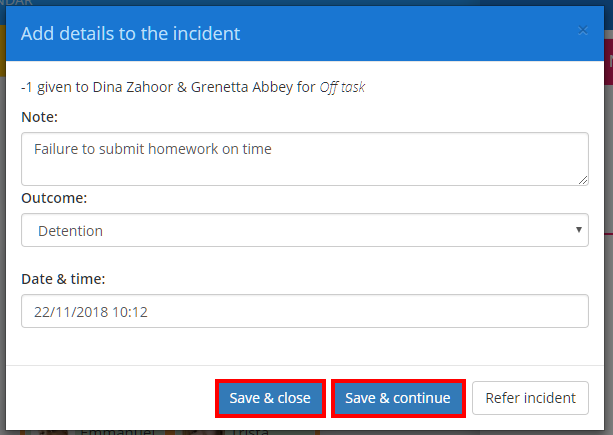 To award a behaviour to all pupils who did not submit their homework task on time, click on the Award all not submitted button along the top of the page. 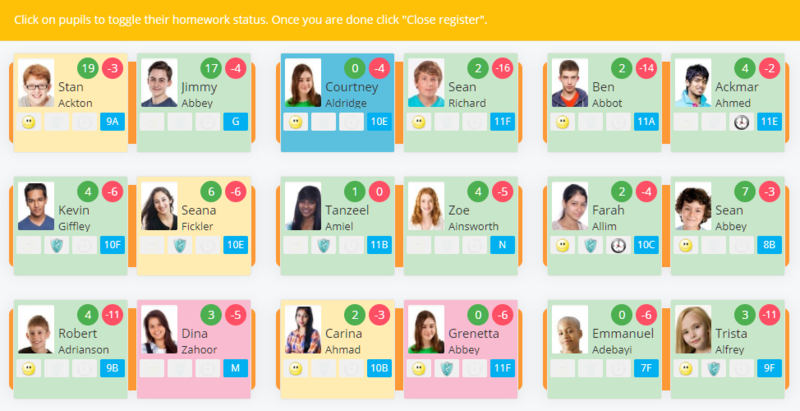 A popup will appear, listing all pupils that did not submit the homework task. You can enter additional information about the behaviour in the Note and Outcome fields.